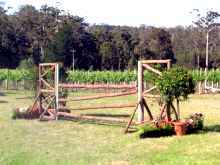 Venue - Smithbrook Winery, Pemberton, SW Western Australia. After hearing so many good things about this event last year we decided to venture down to this years event to experience for ourselves the fine wine, food and jumping on offer. I have to say that the weekend lived up to everything we had heard and more. What we didn’t count on was the added drama of Pippa Page breaking her leg on the Friday, and waving to the ambulance with Pam & Mark in tow as we passed them half way to Bunbury. I know that Pippa has been waiting very patiently to be featured in our Wings newsletter – but did you have to do it this way Pip? Friday night at the Pemberton Hotel and ¾’s of the guests were showjumping related. Cookie and Ross Newman were giving host for the following day ABC’s Liam Bartlett a quick run down over dinner of what showjumping is all about – and they must have done a good job or Liam is exceptionally perceptive as he asked the most intelligent questions over the mike the next day and handled himself with absolute aplomb. I will let you decide as to whether it was the coaching from Cookie and Ross or his general intelligence that helped him through. In all it was a real coup to have him there and he certainly added to the interest and ambiance of the day. On the derby day itself you could be forgiven for thinking it was actually Melbourne Cup day. There were some extremely well dressed ladies there in all their finery and hats none more so than the owners of Kellie Ann’s Fireside who were making their second trip to Smithbrook with a group of girlfriends and would have no doubt won the fashions on the field competition. The layout of the course amongst the vines and trees is truly picturesque and Manager of Smithbrook, Jono Farrington and co event planner Roger Kammann have done a superlative job with both the course and event management. Flowers, green grass and fantastically helpful and smartly attired staff (eg Sharon Kammann) where ever you looked. The weather was also very kind with a bright sunny day with a hint of a cool breeze. The first event on the card was the Landmark Open Speed Derby, one round against the clock. A chance for horses to test the course for later events and after only 6 or so horses the bogey fence for the day was named. The infamous 3a and b, and there were very few throughout the day that were able to get through the tricky double in set amongst the vines clean. Wouldn’t you know it but home ground advantage was really to the fore in the first class. Roger who rode in his hunting red jacket (looking very classy) won the class on Jono’s horse and Jono was third on his other horse. rustic straight bar following the water. The beginning of the second class also coincided with the beginning of the prebooked lunch in the Restaurant Marquee. Tickets were $100 per head, which was all inclusive of seven courses beautifully accompanied by the Smithbrook range of wines. Both the hospitality marquees at Smithbrook are catered by local chefs using the best of local produce such as fresh marron, smoked trout, cured ham, Moroccan lamb and local cheeses and freshly grown seasonal salad ingredients. Luckily there was time in between each course to venture out onto the balcony for a full view of the jumping. For those not wanting such a formal luncheon the Café marquee provided picnic hampers, gourmet rolls, freshly made pastries and of course a Smithbrook catered bar. Back to the jumping and the young D& C graders didn’t give the locals their own way in this class. Only three went clear and Janelle Madigan was the first to go in the jumpoff. Unfortunately she had one down. Next out was Les Bunning and Now and Then who burned around the course – clear. Emma Carlisle and the improving Red Boots rode a fantastic round but were unlucky to have one down. So the evergreen and experienced Les Bunning won, Emma was second and Janelle third. Next up was the main the class for the day the Smithbrook Wines & Combined Horse Transport Open Derby. This was a classic Derby class – very long and had to be ridden at 400m per minute. Course designer Peter Cooke certainly made it a classic course. 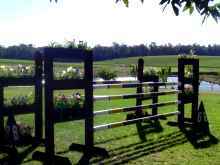 A double on top of the bank, down the bank and one stride to an oxer, a strategically placed water going downhill followed immediately by a rustic straight fence, and the infamous 3A&B in the vines were still causing riders problems. Two riders were clear after the first round. 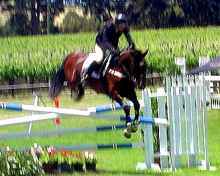 Kelly-Ann and Fireside (who won the event last year) and Nellandra Henry and the evergreen 20 year old Special Agent or Hobby as he is known during the week when he is used as a school horse to double dink disabled riders at the Claremont Therapeutic Riding Centre. This is the horse that Guy Wallace gets to dink on as part of his recuperation. Special Agent rattled a few in the second round but was clear and now it was all up to Kelly-Ann. 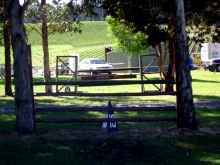 The Melbourne Cup ladies were on their feet to watch their steed Fireside in the second round but not even their popular support was enough as he had a couple down. The Hovell and Henry Clan were in fine voice for the presentations and I’m sure Meliss’s whoopees could be heard in Pemberton. The last class was the Manpower Puissance and this coincided with the last course of local chesses and coffee in the Restaurant tent. Hermine Zielinski whose horse had been going well all day was a very deserved winner of the class with the wall at around 1.65 (I think). Gail Hellier and Shegozigo were second finishing a really good day for Gail and Janelle Madigan and the 22 year old Noble York were third. What a day for the oldies! It was time then to have a quick drink and then organise ourselves to watch the Rugby Final on Jono’s TV on his back lawn. What started with a small crowd at the start of the game became larger and more vocal as the game went on. Someone allowed a couple of Poms to watch with us – a big mistake. We never want to hear Sweet Chariot ever again. Although us Aussies weren’t all that quiet either – when Lotti scored that first try we were all on our feet shouting and I must say that Cookie and Liam were amounts the loudest. The atmosphere and camaraderie was fantastic and the great game that it was, really capped off what had been a fantastic day. The picturesque venue, great food and wine and holiday atmosphere make it a fantastic show and makes the drive from Perth seem irrelevant. 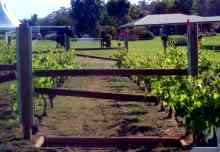 We all came away thinking we would loved to have spent more time there and explore the area more fully as we passed many many wineries, café’s and galleries and those beautiful forests. We thank the owners of Smithbrook – Petaluma Wines for putting the show on and we implore you to run it again next year. To Jono, Roger and all your crew “well done on a fantastic event” and we look forward to coming back next year and bringing lots more people with us so that they can enjoy this unique experience.